This chapter proposes that in the modern university in Thailand, the interests of individual students, universities and nations are all surrounded by the interests of global markets and while global market interests are not separate from the other three, they need to be distinguished separately for the purposes of this analysis. It will examine international, global, regionalist and local Thai approaches that are operating within an awareness of now pressing global market forces in higher education. 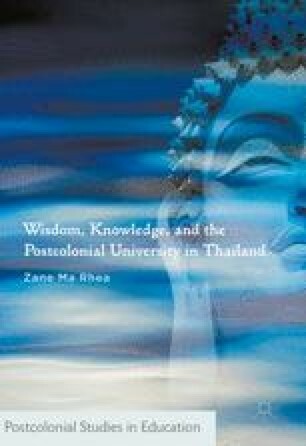 The possibilities (or not) of thinking across national or cultural differences, of examining different contexts of wisdom and knowledge within the intersection of ideas of internationalisation, globalisation, regionalism, together with Thai perspectives can then be better understood. Secretariat, Colombo Plan. 2015. “History.” http://www.colombo-plan.org/index.php/about-cps/history/.